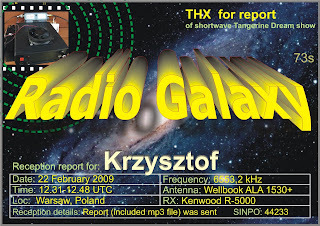 On the left you can see Radio Galaxy QSL card. Thank you very much to Radio Galaxy operator for this wonderful card ! 3900: Mystery Radio on this unusual channel ! @ 18.04. Unfortunatelly here the signal is much worse here at my location, SINPO: 32232. Later, at 18.27 noticed on 3910 kHz with SINPO 32233 [strong interference from utility station on 3915 kHz]. 3905: UNID station @ 19.15. SINPO 42343. At 19.18 noticed when got back to 6220 kHz, SINPO 54454. And still via Playback International on 6880 kHz. 6880: Playback Radio @ 19.17. SINPO 33343. Relaying Mystery Radio. 6880: Radio Playback @ 23.07. SINPO 44333. With live programming. 1629,50: UNID station @ 20.35. SINPO 31222. A station playing Greek music. 1634,40: UNID station @ 20.38. SINPO 21121. 1665: UNID station @ 20.40. SINPO 11111. 1688,20: UNID station @ 20.44. SINPO 21221. 1745,20: UNID station @ 20.16. SINPO 22232. A station playing Greek music. 6880: Radio Playback @ 13.25. SINPO 35333. Playing rock'n'roll of the 50-ties. ID given at 13.27. Still on air when checked at 20.47 UTC. 6220: Radio Mystery @ 13.28. SINPO 44333. 6880: Radio Playback @ 23.12. SINPO 34334. Playing a song with words "Welcome back"... Still on air at 01.43 Saturday with a song from "Grease" musical ... Nice to hear Playback Int. so long in the night ! 6880: Radio Playback @ 23.01. SINPO 34344. Welcome back on this "usual" place on the dial for Playback ! 6220: Mystery Radio (tent) @ 19.05. SINPO 54454. Excellent signal today ! 6220: Mystery Radio @ 17.44. SINPO 34333. 6220: Mystery Radio @ 19.48. SINPO 44444. Also checked at 21.06 UTC, giving out 21.07 UTC an ID, with SINPO 54554. Sign-off at 23.09 UTC. 6220: Mystery Radio (tent) @ 18.26. SINPO 31432. Co-channel interference from a strong station broadcasting from a couple of days on the 6220 kHz frequency (presumably transmitting in Arabic). 6884: UNID station @ 18.35. SINPO 13222. 6220,20: Delta Radio @ 07.14. SINPO 34343. ID at 07.14, saying also that it is testing on only 5 Watt transmitter (!). Very good reception in my place bearing in mind very low power of the transmitter and my rather noisy location ! 6220: Mystery Radio @ 20.11. SINPO 44454. 6220: Mystery Radio @ 18.27. SINPO 54344. Playing dance music.